THE LIGHT UPON THE MOOR Baskerville Hall, Oct. 15th. If I was compelled to leave you without much news during the early days of my mission you must acknowledge that I am making up for lost time, and that events are now crowding thick and fast upon us. In my last report I ended upon my top note with Barrymore at the window, and now I have quite a budget already which will, unless I am much mistaken, considerably surprise you. Things have taken a turn which I could not have anticipated. In some ways they have within the last forty-eight hours become much clearer and in some ways they have become more complicated. But I will tell you all and you shall judge for yourself. Before breakfast on the morning following my adventure I went down the corridor and examined the room in which Barrymore had been on the night before. The western window through which he had stared so intently has, I noticed, one peculiarity above all other windows in the house — it commands the nearest outlook on to the moor. There is an opening between two trees which enables one from this point of view to look right down upon it, while from all the other windows it is only a distant glimpse which can be obtained. It follows, therefore, that Barrymore, since only this window would serve the purpose, must have been looking out for something or somebody upon the moor. The night was very dark, so that I can hardly imagine how he could have hoped to see anyone. It had struck me that it was possible that some love intrigue was on foot. That would have accounted for his stealthy movements and also for the uneasiness of his wife. The man is a striking-looking fellow, very well equipped to steal the heart of a country girl, so that this theory seemed to have something to support it. That opening of the door which I had heard after I had returned to my room might mean that he had gone out to keep some clandestine appointment. So I reasoned with myself in the morning, and I tell you the direction of my suspicions, however much the result may have shown that they were unfounded. But whatever the true explanation of Barrymore’s movements might be, I felt that the responsibility of keeping them to myself until I could explain them was more than I could bear. I had an interview with the baronet in his study after breakfast, and I told him all that I had seen. He was less surprised than I had expected. “Perhaps then he pays a visit every night to that particular window,” I suggested. “I believe that he would do exactly what you now suggest,” said I. “The man is rather deaf, and in any case we must take our chance of that. We’ll sit up in my room tonight and wait until he passes.” Sir Henry rubbed his hands with pleasure, and it was evident that he hailed the adventure as a relief to his somewhat quiet life upon the moor. The baronet has been in communication with the architect who prepared the plans for Sir Charles, and with a contractor from London, so that we may expect great changes to begin here soon. There have been decorators and furnishers up from Plymouth, and it is evident that our friend has large ideas and means to spare no pains or expense to restore the grandeur of his family. When the house is renovated and refurnished, all that he will need will be a wife to make it complete. Between ourselves there are pretty clear signs that this will not be wanting if the lady is willing, for I have seldom seen a man more infatuated with a woman than he is with our beautiful neighbour, Miss Stapleton. And yet the course of true love does not run quite as smoothly as one would under the circumstances expect. Today, for example, its surface was broken by a very unexpected ripple, which has caused our friend considerable perplexity and annoyance. After the conversation which I have quoted about Barrymore, Sir Henry put on his hat and prepared to go out. As a matter of course I did the same. “What, are you coming, Watson?” he asked, looking at me in a curious way. “That depends on whether you are going on the moor,” said I.
I hurried along the road at the top of my speed without seeing anything of Sir Henry, until I came to the point where the moor path branches off. There, fearing that perhaps I had come in the wrong direction after all, I mounted a hill from which I could command a view — the same hill which is cut into the dark quarry. Thence I saw him at once. He was on the moor path about a quarter of a mile off, and a lady was by his side who could only be Miss Stapleton. It was clear that there was already an understanding between them and that they had met by appointment. They were walking slowly along in deep conversation, and I saw her making quick little movements of her hands as if she were very earnest in what she was saying, while he listened intently, and once or twice shook his head in strong dissent. I stood among the rocks watching them, very much puzzled as to what I should do next. To follow them and break into their intimate conversation seemed to be an outrage, and yet my clear duty was never for an instant to let him out of my sight. To act the spy upon a friend was a hateful task. Still, I could see no better course than to observe him from the hill, and to clear my conscience by confessing to him afterwards what I had done. It is true that if any sudden danger had threatened him I was too far away to be of use, and yet I am sure that you will agree with me that the position was very difficult, and that there was nothing more which I could do. Our friend, Sir Henry, and the lady had halted on the path and were standing deeply absorbed in their conversation, when I was suddenly aware that I was not the only witness of their interview. A wisp of green floating in the air caught my eye, and another glance showed me that it was carried on a stick by a man who was moving among the broken ground. It was Stapleton with his butterfly-net. He was very much closer to the pair than I was, and he appeared to be moving in their direction. At this instant Sir Henry suddenly drew Miss Stapleton to his side. His arm was round her, but it seemed to me that she was straining away from him with her face averted. He stooped his head to hers, and she raised one hand as if in protest. Next moment I saw them spring apart and turn hurriedly round. Stapleton was the cause of the interruption. He was running wildly towards them, his absurd net dangling behind him. He gesticulated and almost danced with excitement in front of the lovers. What the scene meant I could not imagine, but it seemed to me that Stapleton was abusing Sir Henry, who offered explanations, which became more angry as the other refused to accept them. The lady stood by in haughty silence. Finally Stapleton turned upon his heel and beckoned in a peremptory way to his sister, who, after an irresolute glance at Sir Henry, walked off by the side of her brother. The naturalist’s angry gestures showed that the lady was included in his displeasure. The baronet stood for a minute looking after them, and then he walked slowly back the way that he had come, his head hanging, the very picture of dejection. What all this meant I could not imagine, but I was deeply ashamed to have witnessed so intimate a scene without my friend’s knowledge. I ran down the hill therefore and met the baronet at the bottom. His face was flushed with anger and his brows were wrinkled, like one who is at his wit’s ends what to do. I tried one or two explanations, but, indeed, I was completely puzzled myself. Our friend’s title, his fortune, his age, his character, and his appearance are all in his favour, and I know nothing against him unless it be this dark fate which runs in his family. That his advances should be rejected so brusquely without any reference to the lady’s own wishes and that the lady should accept the situation without protest is very amazing. However, our conjectures were set at rest by a visit from Stapleton himself that very afternoon. He had come to offer apologies for his rudeness of the morning, and after a long private interview with Sir Henry in his study the upshot of their conversation was that the breach is quite healed, and that we are to dine at Merripit House next Friday as a sign of it. So there is one of our small mysteries cleared up. It is something to have touched bottom anywhere in this bog in which we are floundering. We know now why Stapleton looked with disfavour upon his sister’s suitor — even when that suitor was so eligible a one as Sir Henry. And now I pass on to another thread which I have extricated out of the tangled skein, the mystery of the sobs in the night, of the tear-stained face of Mrs. Barrymore, of the secret journey of the butler to the western lattice window. Congratulate me, my dear Holmes, and tell me that I have not disappointed you as an agent — that you do not regret the confidence which you showed in me when you sent me down. All these things have by one night’s work been thoroughly cleared. I have said “by one night’s work,” but, in truth, it was by two nights’ work, for on the first we drew entirely blank. I sat up with Sir Henry in his rooms until nearly three o’clock in the morning, but no sound of any sort did we hear except the chiming clock upon the stairs. It was a most melancholy vigil and ended by each of us falling asleep in our chairs. Fortunately we were not discouraged, and we determined to try again. The next night we lowered the lamp and sat smoking cigarettes without making the least sound. It was incredible how slowly the hours crawled by, and yet we were helped through it by the same sort of patient interest which the hunter must feel as he watches the trap into which he hopes the game may wander. One struck, and two, and we had almost for the second time given it up in despair when in an instant we both sat bolt upright in our chairs with all our weary senses keenly on the alert once more. We had heard the creak of a step in the passage. Very stealthily we heard it pass along until it died away in the distance. Then the baronet gently opened his door and we set out in pursuit. Already our man had gone round the gallery and the corridor was all in darkness. Softly we stole along untii we had come into the other wing. We were just in time to catch a glimpse of the tall, black-bearded figure, his shoulders rounded as he tiptoed down the passage. Then he passed through the same door as before, and the light of the candle framed it in the darkness and shot one single yellow beam across the gloom of the corridor. We shuffled cautiously towards it, trying every plank before we dared to put our whole weight upon it. We had taken the precaution of leaving our boots behind us, but, even so, the old boards snapped and creaked beneath our tread. Sometimes it seemed impossible that he should fail to hear our approach. However, the man is fortunately rather deaf, and he was entirely preoccupied in that which he was doing. When at last we reached the door and peeped through we found him crouching at the window, candle in hand, his white, intent face pressed against the pane, exactly as I had seen him two nights before. We had arranged no plan of campaign, but the baronet is a man to whom the most direct way is always the most natural. He walked into the room, and as he did so Barrymore sprang up from the window with a sharp hiss of his breath and stood, livid and trembling, before us. His dark eyes, glaring out of the white mask of his face, were full of horror and astonishment as he gazed from Sir Henry to me. “He must have been holding it as a signal,” said I. “Let us see if there is any answer.” I held it as he had done, and stared out into the darkness of the night. Vaguely I could discern the black bank of the trees and the lighter expanse of the moor, for the moon was behind the clouds. And then I gave a cry of exultation, for a tiny pin-point of yellow light had suddenly transfixed the dark veil, and glowed steadily in the centre of the black square framed by the window. “There it is!” I cried. The man’s face became openly defiant. “No, no, sir; no, not against you!” It was a woman’s voice, and Mrs. Barrymore, paler and more horror-struck than her husband, was standing at the door. Her bulky figure in a shawl and skirt might have been comic were it not for the intensity of feeling upon her face. “We have to go, Eliza. This is the end of it. You can pack our things,” said the butler. The woman’s words came with an intense earnestness which carried conviction with them. “I will come,” said I. “Are you armed?” I asked. As if in answer to his words there rose suddenly out of the vast gloom of the moor that strange cry which I had already heard upon the borders of the great Grimpen Mire. It came with the wind through the silence of the night, a long, deep mutter then a rising howl, and then the sad moan in which it died away. Again and again it sounded, the whole air throbbing with it, strident, wild, and menacing. The baronet caught my sleeve and his face glimmered white through the darkness. “What do they call this sound?” he asked. We stumbled slowly along in the darkness, with the black loom of the craggy hills around us, and the yellow speck of light burning steadily in front. There is nothing so deceptive as the distance of a light upon a pitch-dark night, and sometimes the glimmer seemed to be far away upon the horizon and sometimes it might have been within a few yards of us. But at last we could see whence it came, and then we knew that we were indeed very close. A guttering candle was stuck in a crevice of the rocks which flanked it on each side so as to keep the wind from it and also to prevent it from being visible, save in the direction of Baskerville Hall. A boulder of granite concealed our approach, and crouching behind it we gazed over it at the signal light. It was strange to see this single candle burning there in the middle of the moor, with no sign of life near it — just the one straight yellow flame and the gleam of the rock on each side of it. “What shall we do now?” whispered Sir Henry. The words were hardly out of my mouth when we both saw him. Over the rocks, in the crevice of which the candle burned, there was thrust out an evil yellow face, a terrible animal face, all seamed and scored with vile passions. Foul with mire, with a bristling beard, and hung with matted hair, it might well have belonged to one of those old savages who dwelt in the burrows on the hillsides. The light beneath him was reflected in his small, cunning eyes which peered fiercely to right and left through the darkness like a crafty and savage animal who has heard the steps of the hunters. Something had evidently aroused his suspicions. It may have been that Barrymore had some private signal which we had neglected to give, or the fellow may have had some other reason for thinking that all was not well, but I could read his fears upon his wicked face. Any instant he might dash out the light and vanish in the darkness. I sprang forward therefore, and Sir Henry did the same. At the same moment the convict screamed out a curse at us and hurled a rock which splintered up against the boulder which had sheltered us. I caught one glimpse of his short, squat, strongly built figure as he sprang to his feet and turned to run. At the same moment by a lucky chance the moon broke through the clouds. We rushed over the brow of the hill, and there was our man running with great speed down the other side, springing over the stones in his way with the activity of a mountain goat. A lucky long shot of my revolver might have crippled him, but I had brought it only to defend myself if attacked and not to shoot an unarmed man who was running away. And it was at this moment that there occurred a most strange and unexpected thing. We had risen from our rocks and were turning to go home, having abandoned the hopeless chase. The moon was low upon the right, and the jagged pinnacle of a granite tor stood up against the lower curve of its silver disc. 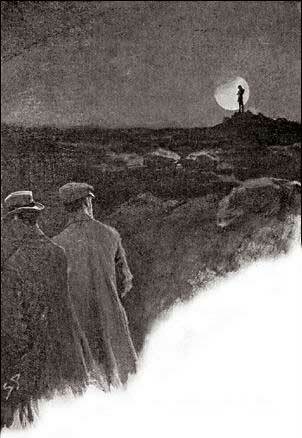 There, outlined as black as an ebony statue on that shining background, I saw the figure of a man upon the tor. Do not think that it was a delusion, Holmes. I assure you that I have never in my life seen anything more clearly. As far as I could judge, the figure was that of a tall, thin man. He stood with his legs a little separated, his arms folded, his head bowed, as if he were brooding over that enormous wilderness of peat and granite which lay before him. He might have been the very spirit of that terrible place. It was not the convict. This man was far from the place where the latter had disappeared. Besides, he was a much taller man. With a cry of surprise I pointed him out to the baronet, but in the instant during which I had turned to grasp his arm the man was gone. There was the sharp pinnacle of granite still cutting the lower edge of the moon, but its peak bore no trace of that silent and motionless figure. I wished to go in that direction and to search the tor, but it was some distance away. The baronet’s nerves were still quivering from that cry, which recalled the dark story of his family, and he was not in the mood for fresh adventures. He had not seen this lonely man upon the tor and could not feel the thrill which his strange presence and his commanding attitude had given to me. “A warder, no doubt,” said he. “The moor has been thick with them since this fellow escaped.” Well, perhaps his explanation may be the right one, but I should like to have some further proof of it. Today we mean to communicate to the Princetown people where they should look for their missing man, but it is hard lines that we have not actually had the triumph of bringing him back as our own prisoner. Such are the adventures of last night, and you must acknowledge, my dear Holmes, that I have done you very well in the matter of a report. Much of what I tell you is no doubt quite irrelevant, but still I feel that it is best that I should let you have all the facts and leave you to select for yourself those which will be of most service to you in helping you to your conclusions. We are certainly making some progress. So far as the Barrymores go we have found the motive of their actions, and that has cleared up the situation very much. But the moor with its mysteries and its strange inhabitants remains as inscrutable as ever. Perhaps in my next I may be able to throw some light upon this also. Best of all would it be if you could come down to us. In any case you will hear from me again in the course of the next few days.